Here, for no reason I can identify except I found it fun and the last long weekend of summer is upon us, are some statistics on the state of Hollywood movies. All numbers are from Box Office Mojo. Something happened to those numbers, incidentally. Take the number of movies released every year. These are obviously “major” or “tracked” releases, since there are innumerable direct-to-digits (DVDs, Blueray, or the internet). What makes a movie worth tracking, I have no idea. In 1980, the earliest year on record, there were 161 movies, which only increased by a dozen the next year. But by 1982 this was 428. So I suspect a typo, or change in counting method, or maybe even that the numbers are real. This was on the downslope of a major recession, after all. 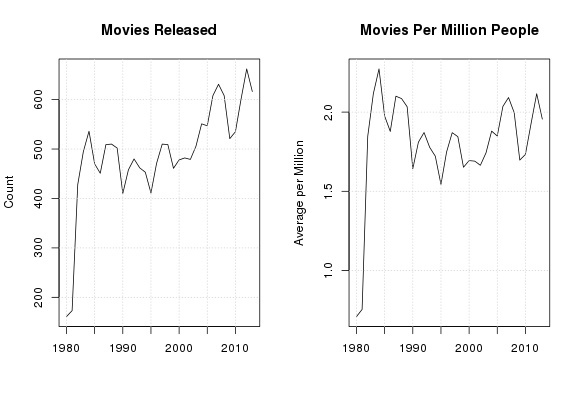 Here are the number of movies released per year domestically and the same normalized by US population (millions). A more-or-less increase, with some dips and peaks. Adjusting for population makes sense if you think of movies being a consumable product, which most are. Averages out to not quite two movies for every million eyeballs; slightly higher if you consider the very old and young and some others don’t watch (actively). Again, this is low (for the same reason) and only on average. 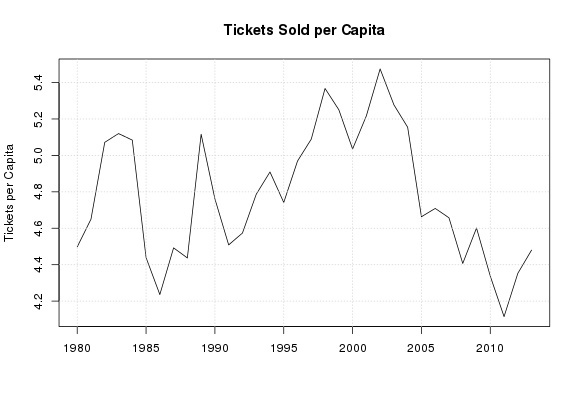 People have been buying fewer tickets, on average. Slight uptick projected—and this is only a projection—for this year, embedded in a downward trend. 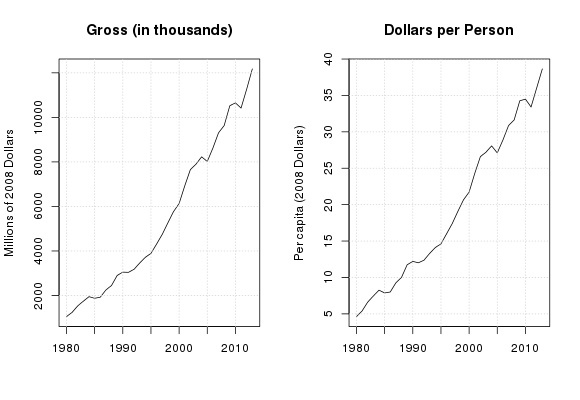 Next is CPI-adjusted gross receipts (in millions of 2008 dollars) and the same per capita (in 2008 dollars). Onwards and ever upwards. All on average, of course, but the amount people are willing to spend on flicks is increasing, mostly because ticket prices are skyrocketing. This hasn’t discouraged viewers too much or at all. 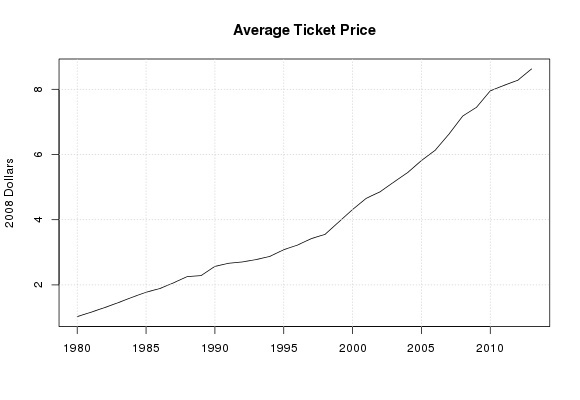 As proof of that, this: the average ticket price (in 2008 dollars). 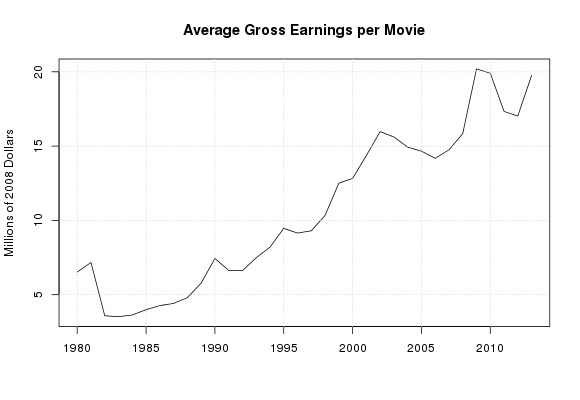 And this, the average gross earnings per movie in millions of 2008 dollars. Note that this is the average. The average movie only brings in $18 million bucks, more or less. Gross is not net. Even with modest assumptions on the cost of making, marketing, distribution, and showing films, most movies must be operating at a loss. What a strange business. Possibly apropos: I’ve only been to the movies twice in two or three years. I think the last flick I saw was The Artist (2011; I liked it!). Shows how easy it is to miss what’s right in front of you. With the ticket price increasing (and a big jump for 3D movies) it really bugs me that movies are rated by box office $ not bums on seats. I guess they have to keep having records to shout about, but it is pretty meaningless for comparison purposes. And as to profit, there is a whole accounting branch dedicated to making movies which don’t make enough “profit” to pay any tax, but which keep the investors happy to invest in the industry! All this for people who pretend to someone they are not, regurgitate words someone else wrote and are so stupid they need a director to tell them how to do it. They live in a world of make believe and we respect their opinions?! All while making MILLIONS of dollars! They will sell anything you put a script and check in front of them for. They are the idols of the low informed. No wonder this country is failing so fast. Let’s not even talk about stupid athletes pay. What you fail to account for here is international distribution. The bulk of film revenue comes from overseas these days. How many movies in the 80s were distributed in China? Not a failure. I purposely left them out so I could normalize by population. The money totals are only domestic and do not include the international take.